While following an isolated downpour along Florida’s Alligator Alley I stopped at a location that had a break in the Sawgrass to capture an interesting foreground in the image. 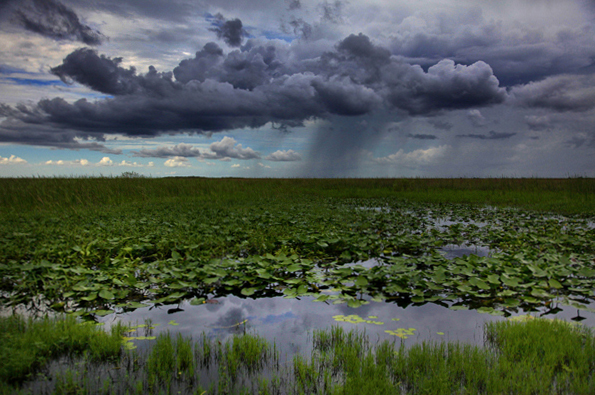 The dark clouds were reflected in the water as the storm moved across the River of Grass, while the slanted rain in the background completed the scene. When shooting, composition is key. Often you will see a scenic framed by trees or other natural borders. I like to think outside the Box, pun intended, when I am framing an image. Here I used the dark clouds, approaching downpour and reflection of the trees in the water to form a Natural Frame around the scene. This image was created at Markham Park http://bit.ly/VSCaWP in Broward County, Florida (@readybroward), which also offers camping, mountain bike trails, a gun range and dog park…fun for the entire family. On some evenings they even have a large telescope set up for viewing other planets that may be closer to earth than usual. It’s an all around stellar place…forgive me, I couldn’t resist..